Three very different national histories are marred by their refusal to admit neighbours into the narrative, writes David Cannadine from the Financial Times. The Venerable Bede was the first in the field with his Ecclesiastical History of the English People, completed in AD731. Almost 1,200 years and much more history later, another Northumbrian, G.M. Trevelyan, produced the defining account of the national past, not only for his generation but for the next as well. Yet few histories of England have ever attained the canonical status of Bede or Trevelyan, and the best put-down to what has all too often been a formulaic, parochial and self-satisfied genre remains 1066 and All That by W.C. Sellar and R.J. Yeatman. In a bravura display of historical comedy, they unrelentingly sent up the conventional national narratives built around dates and dynasties, which categorised all people and events as either “good” or “bad”, which chronicled England’s pre-destined rise to being “top nation”, and which lamented that history came to a “full stop” when that pre-eminence was given up at the close of the first world war. Sellar and Yeatman published their incisive masterpiece of historical hilarity in 1930 but it would be another 50 years before the no-longer-deniable decline of Britain as a great power, and the growing demands for devolution in Wales and Scotland, combined with the “Troubles” in Northern Ireland, encouraged a fundamental rethink of the traditional English national narrative – a reappraisal beginning in 1984 with the Oxford Illustrated History of Britain, developed by Hugh Kearney in his “four nations” history of the British Isles, and brought to broader public attention either side of the millennium by Norman Davies in The Isles: A History and by Simon Schama in his television series History of Britain. As they saw it, the history of England was no longer the right way to define, approach or understand the national past: instead, they urged a more complex and nuanced treatment, exploring the relations between England, Ireland, Scotland and Wales, recognising the constructed and contingent nature of “Britishness” and paying appropriate attention to the constant interactions between the British and continental Europe and the wider world beyond. Thus understood, the English past was merely one specific component of a much bigger history and multilayered narrative. But if the three books under review here are any indication, English history has carried on regardless: for their authors are wholly unengaged with or unimpressed by the scholarly rethinking and upscaling of what constitutes our national past that has by now been going on for three decades and more. John Julius Norwich would shed no tears if Scotland became independent and he focuses exclusively on England because writing its history in one hundred places was just about possible, whereas dealing with Britain as a whole with the same number was not. For Simon Jenkins, too, England is the subject of his concern. Wales, Scotland and Ireland are separate countries with separate histories, which have only occasionally connected with England: Wales was “a thorn in the side of Norman monarchs”; Scotland had an unrivalled “capacity for causing trouble” for the English; while after the Act of Union, Ireland was “a curse on British political leaders”. And although he had thought of including the histories of Wales, Scotland and Ireland, Peter Ackroyd also concentrates on England, on the grounds that a broader approach would run the risk of “their seeming to become merely extensions of England” – which is exactly how he treats them anyway. So here, once again, are three little England histories: 1066 and All That, but without the jokes. In A Short History of England, Simon Jenkins provides a brisk and confident narrative from the Saxon dawn beginning in 410 to David Cameron exactly 1,600 years later. He focuses on high politics: kings and queens, war and peace, with (as might be expected of a National Trust chairman) occasional allusions to landscape, churches and country houses. There is nothing here that is new and his account is devoid of context, analysis or explanation, falling back on such banalities as “England had a genius for opportunistic social change” and “new forces were now coming into play”. The Black Death, the “rising middle classes” of Tudor and Stuart times, and the Industrial Revolution are dismissed in little more than a few lines. The marriage of the Prince of Wales and Lady Diana Spencer is thought of more importance than the publication of Darwin’s On the Origin of Species or the Indian Mutiny. If the book has a theme, it is the growth of parliament, but this is insufficiently developed. In the conclusion, we are told on one page that no extra-parliamentary movement has ever acquired political traction but, soon after, we learn that progress in England has always been the result of social, economic and political change welling up from below. It is impossible to make sense of such contradictory signals. Peter Ackroyd’s Foundation is not only on a larger scale than Jenkins’ brief canter across the centuries, it is also the first of a projected six-volume history of England, which will test the stamina not only of the author but also of his readers. In this opening instalment, he takes us from pre-Stonehenge times to the death of Henry VII in 1509. As with Jenkins, the narrative is built around the reigns of kings and queens, and their interminable quarrels, and even Ackroyd’s talents as a storyteller are taxed when he takes us through the Wars of the Roses, where everyone seems to have been called Henry or Edward or, alternatively, Norfolk or Suffolk, or Gloucester or Salisbury. These chapters stress chance, contingency and unintended consequences, and he interleaves them with accounts of the ordinary lives of ordinary people: religion, family, education, crime, medicine and so on. According to Ackroyd, it is in the deep continuity of ordinary people’s lives and circumstances, rather than in the chaos and confusion of royal politics and dynastic quarrels, that the essence of English history and national identity is to be found. But he offers no convincing explanation as to how or why this has been true or could be true; and he seems unaware of the fact that the job of the historian is at least as much to investigate and question identities as to support and create them. Like Jenkins, Ackroyd adopts a traditional style of exposition, and tells us little that is new, whereas John Julius Norwich adopts a wholly novel approach, whose obvious indebtedness to Neil MacGregor’s recent History of the World in 100 Objects in no sense diminishes his own book’s interest. In A History of England in 100 Places, he takes us from Stonehenge to the Gherkin, via Offa’s Dyke, Bodiam Castle, Blenheim Palace, Ironbridge, the Albert Memorial and the National Theatre; but he also includes such unexpected places as Brick Lane Mosque in London, Old Sarum in Wiltshire, the Liverpool houses in which John Lennon and Paul McCartney grew up, and Greenham Common. In these short histories, Norwich succeeds in conveying the complex texture and endless fascination of English history in ways that elude both Jenkins and Ackroyd. He has wise things to say about, for example, the general ghastliness of medieval life and medieval monarchs, the splendours of the King James Bible (“the only world-class masterpiece ever created by a committee”), the limitations of the English educational system, and the inexcusable destruction of Dresden by the allies during the second world war (though he does harbour a particular – and unexplained – animus against Queen Anne). Despite their differences of scale and approach, dates and names and kings and queens loom very large in all three of these books. Ackroyd takes us through English history from the Saxons to the Yorkists reign by reign; Norwich prints a list of monarchs from Offa to Elizabeth II; and Jenkins not only has his own table of English sovereigns but also adds the names of all prime ministers from Sir Robert Walpole to David Cameron, along with his choice of 100 key dates, which he regards as “the finger-posts of history”, and as “the most important turning points in the national story”. No one would deny that names and dates, narrative and chronology, are important in our past or in that of any other nation. But as these lists serve eloquently (and inadvertently) to show, without context and explanation, so-called “finger posts” and “turning points” can be as meaningless as the names and numbers in a telephone directory. When some politicians call for a “return” to history taught around kings and queens, they need to be reminded that such calls have repeatedly been made for the best part of a century, and that all too often, the cult of names and dates can be a substitute for teaching or learning history, rather than opening up the real thing itself. In addition to their excessive stress on kings and queens, all three authors go too far in asserting the singular importance and identity of England. Ackroyd tells us that Hampshire is “older” than France (but what exactly does that mean, and do the French know or care?). Jenkins insists that England’s history is “the most consistently eventful of any nation on earth” (he does not seem to have heard of China or Iran). And while writing his book, Norwich was constantly struck by “how unlike the English are to any of their neighbours” (though most of their neighbours would probably say the same thing about themselves). But while these claims to exceptionalism seem overstated and, indeed, inappropriate to the middle-ranking European power that Britain has for several decades been, all three authors are to be congratulated for offering relatively even-handed accounts of the national past, and for avoiding the sort of cheerleading propaganda that some politicians are also again urging. Each of these books describes extraordinary achievements and (on occasions) admirable and exemplary lives. But they also describe poverty and suffering, cruelty and destruction, duplicity and aggression on a scale that calls to mind what is happening in the most impoverished and war-ravaged parts of the world today. By focusing as they do so specifically on the history of England, all three authors are in ignorant or deliberate denial of a generation’s scholarship that has done so much to make us aware of the many and more complex interactions between England, Wales, Scotland and Ireland, between Britain and France, Scandinavia and Germany, and between Britain and the wider world beyond. A national narrative that gives no more than walk-on parts to the rest of the British Isles, to continental Europe, to the British Empire, and to those places that were never coloured red, is in too many ways a contradiction in terms. Little England has always been part of a bigger world and, for good or ill, English history has taken place in many parts of the globe beyond its boundaries and its shores. It was Rudyard Kipling (among other things the author of a distinctly tendentious national history) who once inquired: “What do they know of England who only England know?” As these three books inadvertently make plain, there are two very different answers to that question. The first is “a considerable amount”. But the second is “not nearly enough”. Rich in History is something Wiltshire is famous for, particularly Salisbury Plain, the large area of chalk downland within Wiltshire. Salisbury Plain is steeped in history, both ancient and modern and can justifiably claim to be the cradle of English civilisation. In prehistory, tribes from Europe migrated north and settled on Salisbury Plain. Remains of defence earthworks, burial and ceremonial grounds are scattered throughout Wiltshire. Many of these sites have public access. 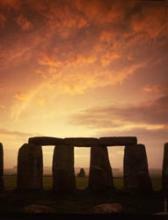 The most world renown is Stonehenge, a World Heritage Site, north of Salisbury and close to Amesbury. Also a World Heritage Site are the Avebury stone circles (both an outer and a smaller inner circle), not so famous as Stonehenge but equally impressive. Avebury is a few miles west of Marlborough in the north of Wiltshire. From Overton Hill, near Avebury, the famous Ridgeway begins. This is thought to be Britain’s oldest road, used by prehistoric man, herdsmen and soldiers, and follows the northern escarpment of Salisbury Plain north-eastwards through the ancient landscapes of Wiltshire into the Chiltern Hills of Berkshire. The Ridgeway is 85miles (139km) in length, accessible to the public, and has National Trail status. As well as the more ‘modern’ Roman Roads that criss-cross the Wiltshire countryside, Roman and Norman settlements continue very much in evidence, often developed on earlier Iron Age hill fort sites such as Old Sarum. This location was the original Salisbury site, a hill fort occupied by the Romans then latterly by Normans following the Norman Conquest of 1066. The exposed nature of the Old Sarum site and disagreements between the clergy and the military led to the building of the new Salisbury cathedral in 1220 A.D. to the south. The townspeople soon followed and medieval Salisbury grew to the city it is today. Old Sarum, rich in history, with its ruined fortifications is open to the public throughout the year. The Middle Ages were a time of great prosperity for Wiltshire with sheep grazing the chalk downlands and the handwoven woollen cloth in great demand. Many famous buildings, villages and even towns were built from the proceeds. The Industrial Revolution changed everything as mechanical production took over and the weaving industry moved north into the West Riding of Yorkshire. In more recent times much of Wiltshires rich prosperity has come from the many military establishments scattered over the Plain. Wiltshire airfields and army garrisons have trained and deployed troops and aircraft across the world on both fighting and peace-keeping operations and played pivotal roles in the great military campaigns of both World War I and II. Each week I will be blogging on a specific area of Wilsthire and talking about its rich history. A project to find the 100 events and places that played the most significant role in shaping the English language has been launched. From the Anglo-Saxon invasion of the fifth century to modern-day waves of immigration, the English language has been shaped by countless episodes in history. The journey starts in Lakenheath in Suffolk, where the Undley Bracteate medallion was found, dated to 475 and bearing the first evidence of written English. Then in 731 the Venerable Bede completed his Historia Ecclesiastica Gentis Anglorum in Jarrow, Tyne and Wear – the first text to speak of the English language and the English people. 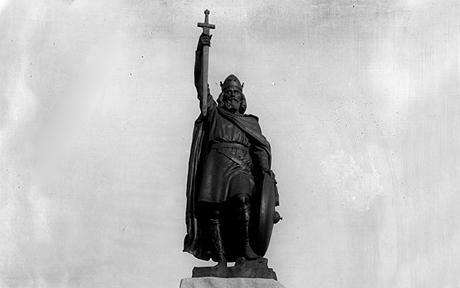 And by 871 King Alfred of Wessex, the first person to call the language “English”, was ordering translations from Latin into West Saxon, a dialect of Old English. In recent times the language has adapted again and again, on its way to becoming the common tongue of 1.8 billion people worldwide. Bill Lucas, a trustee of the English Project and professor of learning at the University of Winchester, said: “This is a wonderful way of engaging people in a wider conversation about the English Language. “We want to get the nation really thinking about the stories behind our evolving language. “How, for example, do you rate the relative significance of Shakespeare’s Stratford-upon-Avon, versus London’s part in the birth of the world wide web? “English has now become the lingua franca of the world. It is the most exciting and exotic language partly because of its capacity to incorporate so many elements of other languages, and somehow to make these dynamic, descriptive and always exciting. “The history of Britain and the history of the English language are also very closely intertwined. The Venerable Bede completed his Historia Ecclesiastica Gentis Anglorum. Although writing in Latin, he was the first person to speak of the English language and the English people. 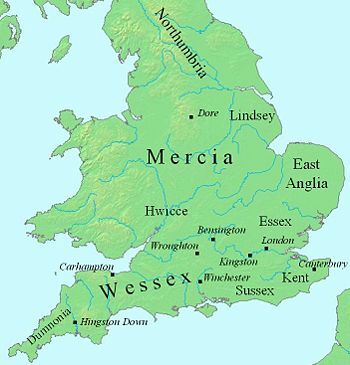 Translations from Latin into the West Saxon dialect of Old English were commissioned by King Alfred of Wessex between 871 and 899. He is the first person known to have called the language “English”. William the Conqueror and his Norman army defeated King Harold at the Battle of Hastings, bringing with them a language that transformed English over the next 300 years. King Henry II of England landed in Waterford, beginning the worldwide exportation of English beyond the island of Great Britain – even though he himself mainly spoke French. On October 13 the Chancellor of England opened Parliament with a speech in English rather than French for the first time. Geoffrey Chaucer was buried in the Abbey. In 1556 he was moved into a more splendid tomb, beginning the tradition of burying great writers in Poets’ Corner. William Caxton introduced printing to England, which became a huge force in the spread of English language literature. William Shakespeare, regarded by many as the greatest writer in the English language, is born. King James’s Hampton Court Conference set a translation team working on what came to be known as the King James Bible, published in 1611. The first newspaper in English was the London Gazette, first published in Oxford in 1665 as the Oxford Gazette. The birthplace of Samuel Johnson, creator of A Dictionary of the English Language. Published in 1755, it set new standards for the writing of English prose. The birthplace of Alexander Graham Bell who invented the telephone in 1876, initiating a major stage in worldwide communication. In 1901, Guglielmo Marconi sent the first radio transmission to St John’s, Newfoundland. North American and British English began to converge again after 300 years of separation. The British Broadcasting Company (BBC) begins transmission, influencing dramatically the way English language is used and spoken. John Lennon lived here from the age of five. With his fellow Beatles, he revolutionised popular song. Tim Berners-Lee, who invented the World Wide Web, is born. English is the dominant language of the internet, and the net is a major factor in the globalisation of English. Patrick Chukwuem Okogwu, also known as rap artist Tinie Tempah, is born. Rap music shows the English language at its flexible best. JK Rowling wrote much of Harry Potter and the Philosopher’s Stone in Nicolson’s Café. Published in June 1997, the series of books started a worldwide reading phenomenon. On Valentine’s Day, mobile phone usage was so widespread that for the first time, more people said “I luv u” by text than said “I love you” by post. Text English is a new and thriving form of the language. I have just been teaching my 5 year old boy archery – an essential part of our history in Britain. This was compulsary 700 years ago…………. I frequently talk about the ‘longbow’ history on my guided tours and wanted to share some more in-depth information. In writing this work, I have tried to create an accurate account of the Longbow’s development and use from its 12th century Welsh beginnings to its eventual military demise in the 16th century. The source material used is by no means a complete list, and as such, I encourage all to perform their own research into this field. Suffice it to say, I present this work as an outline of major events to spark the imagination and to feed the soul. Early 12th Century: The Longbow was developed from a Welsh bow that had been used against the English. During the numerous skirmishes with the Welsh, the English had witnessed the power of this weapon. 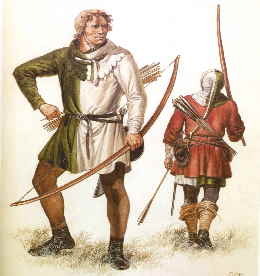 1252: Longbow was accepted as a formal military weapon. C.1280: Longbow adopted by Edward I during the Welsh campaigns after seeing how effectively the Welsh used the bow. 1331-1333: Longbow used by Edward III during the Scottish Campaign. 1337-1453b: The hundred years war with France:During this time, the English and Welsh longbowmen were the most prominent part of the English army, sometimes outnumbering the Men-at-Arms by as much as 10:1. The average was a ratio of about 3:1. 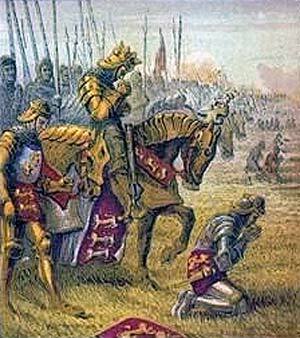 1346: The Battle of Crecy: The English army of Edward III won the first major battle of the 100 Years War. The English numbered between 12,000 and 19,000 men, of which 7,000 to 10,000 were archers. The French Army, under Philip IV was made up of 12,000 mounted Men-at-Arms, 6,000 Genoese Crossbowmen, and up to 60,000 Foot Soldiers. The English were aided by a shower that morning, making a charge up a muddy hill, with the sun in their eyes and arrows raining down on them — most difficult for the French. The opening shots were loosed by the Genoese Crossbowmen, which fell short. The English answered with five times as many arrows, which did not fall short. The Crossbowmen broke ranks and tried to flee the field. The French commander, however, was displeased with the apparent lack of courage and ordered that the Crossbowmen be ridden down by the Heavy Cavalry on their way to the English line. After 16 charges and 90 minutes, the French had lost 4000 knights, including 2 Kings, 2 Dukes, and 3 Counts. English losses were estimated at only 50 men. 1356: The Battle of Poiters: Edward III, The Black Prince of Wales, with 6,000-8,000 men defeated a French host 3 times as large. This time the French fought largely on foot, and this time, much hand to hand fighting took place, with the archers attacking the rear and flanks of the French charge. In the end, the results were much the same as at Crecy. Two thousand French Knights and Nobles, including the Constable of France, 2 Marshals, The Bearer of the Oriflamme, along with thousands of common foot soldiers were killed. One Arch-Bishop, 13 Counts, 5 Viscounts, and 21 Barons and Bannerets were killed or captured. 1415: The Battle of Agincourt: In what was perhaps the greatest victory of the Hundred Years War, a small, sick and exhausted English army under King Henry V, won an astounding victory over a seasoned French host at least three times as large. The composition of the English forces was 1,000 Men-at-Arms and 5,000 Archers divided into the traditional three “battles” with the archers in a wedge pattern flanking each “Battle”. When the battle was over, between 7,000 and 10,000 French had been killed. Among those killed or captured were the Constable of France, a Marshal, 5 Dukes, 5 Counts, and 90 Barons. Fewer that 500 English had been lost during the fighting. The more well equipped archers, the house archer, wore an Open-faced Bascinet or a simple conical helmet, sometimes with a maille Aventail, a “fall” covering the neck and/or cheeks. For body protection, the Padded Gambeson or Aketon was most commonly worn. This was a thick quilted knee length coat with long sleeves that tapered to a tight fit at the forearms, so as not to hinder the archer. Sometimes a Chain-maille shirt was worn over the Gambeson. These shirts were hip-, thigh-, or knee length, with half, three-quarter, or full length sleeves. Obviously the lighter type was more common. Leg plates, shoulder plates (Spaulders or Pauldrons) and similar plate augmentation was uncommon at this stage of history. During this period, the well equipped archer wore a simple open faced Salade or Sallet. Occasionally, these were visored, but one wonders as to the hindrance of such a device. The Jack, a thigh length, diamond quilted version of the Aketon, by this time had become the standard body covering. By the mid 15th Century, Brigandine had started to be used. This was a sleeveless, poncho like jack with integral overlapping plates fastened between layers of stout fabric by a series of rivets. Plate augmentation for the legs, arms, and shoulders seem to have been more prevalent during this period, but it was still uncommon. The weaponry of the well-equipped archer remained fairly constant during this whole period. Besides the archer’s longbow, and a sheaf of 24 war arrows, the archer also carried a dagger, a sword of some type (generally a short sword) and a small shield know as a “Buckler “. The English were renowned “Sword and Buckler” fighters until the 17th Century. Through both centuries, the archer wore the badge and colours of his employer, whether lord, gentry, or city. The Livery Coat or Jacket was common. These garments were made of wool or linen broadcloth, hip or thigh length, with or without collars, and half or full length sleeves, or sleeveless. The badge was sewn or embroidered on the front and sometimes the back of the garment. A white Livery Jacket with the red cross of St. George was very common in the 15th century. The English Longbow is a “self-bow”. This is a single piece of wood that is shaped and seasoned for the purpose. The wood of choice was Yew, but availability problems often required the use of Wych Elm, Elm, and Ash as substitutes. The medieval craftsmen selected the staves with great care. A master Bowyer could craft a bow in under 2 hours! The length of the finished product was from 67 inches to 78 inches in length and up to 2 inches thick at the riser. This length was more or less fitted to the individual user. Draw weights ranged from 80 to 120 pounds. Draw length was between 29 and 32 inches, as the draw was “to the ear” or “to the breast”. The limb had horn knocks inserted to protect the limb tips and to ease stringing of the bow. There was no arrow rest on the handle, it being common to ride the arrow on the index finger. The English Longbow, more than any other weapon of its time, was responsible for vast changes in the nature of medieval warfare. In doing so, it made England the foremost power in Europe during the 14th and 15th centuries. England’s armies became the most feared units in Europe, and with good cause. Almost every battle fought was won by an intelligent utilization of massed archers and men-at-arms. Upon many occasions, English troops were sorely outnumbered, only to win the day. Such was the power of the Longbow, that contemporary accounts claim that at short range, an arrow fired from it could penetrate 4 inches of seasoned oak. The armored knight, considered at one time to be the leviathan of the battlefield, could now be felled at ranges up to 200 yards by a single arrow. One account recalls a knight being pinned to his horse by an arrow that passed through both armored thighs, with the horse and saddle between! Modern tests have verified that this was indeed possible. A 700-800 grain arrow can pierce 9 cm of oak at close range, and 2.5 cm at 200 yards. No armor up to plate was proof against an arrow at less than 200 yards, and even plate could be penetrated at less than 100 yards. Another aspect of the Longbow was the archers themselves. Archers began training at a very early age, traditionally at the age of seven. Training at long ranges was mandatory, complete with fines for violations. Local tournaments were held regularly, and the best archers were chosen for military duty. As these were all hand-picked troops from among the best archers in England, the archer units were an elite group of infantry. These were no base peasant levies; they were all hand-picked craftsmen who well knew their worth in battle. The average English Military Archer could fire 12 to 15 arrows per minute and hit a man-sized target at a minimum of 200 yards. The maximum range was about 400 yards with flight arrows. An archer could not even consider himself skilled at his art if he could not shoot 10 arrows a minute! Note: From our own experiences at faire, we know that 10 aimed shots per minute at a man-sized target at half that range is quite a feat! 1450: Formigny: Four-thousand French, including some well-trained artillerymen routed more than 7,000 English. Most of these were Archers. 1452: Castillon: French cannon all but annihilate 6,000 English. 1588: Longbow replaced by firearms during the Spanish Armada War. 1595: Longbow finally retired from military service. The English war arrow was known as the Livery, Sheaf, or Standard arrow. They had a large diameter, were cut to the legal yard, and were made from a variety of woods. Aspen, Poplar, Elder, Birch, and Willow were used for flight arrows because of their weight. Heavier woods like Ash and Hornbeam were also used, primarily because though a heavier arrow would not travel as far, it had greater penetration. Fletchings were between 7 and 9 inches, and were tied and glued to the shaft. Materials: Bows were made from Yew, Ash, Elm, and Witch-Hazel. Arrows were made from Ash, Oak, Birch, and were feathered with gray goose, peacock, and swan. Full and skeleton gloves appear to have been common, while tabs are not to be found. 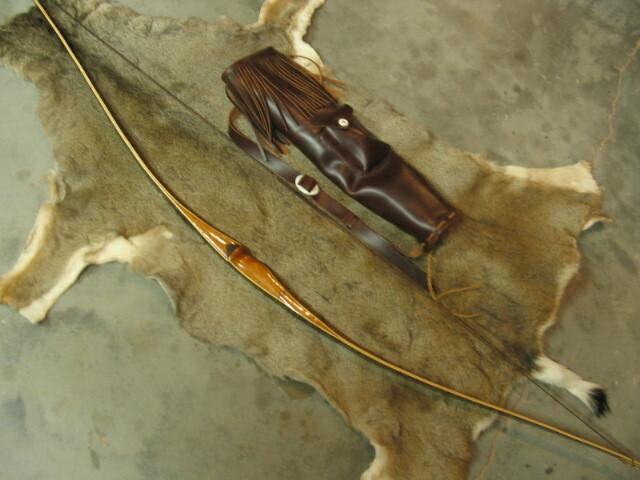 Contrary to popular belief, the common quiver type was a simple belt quiver or arrow bag. In the absence of this, a common practice was to simply stuff a sheaf of arrows through the belt. The back quiver was never used in warfare.